The Chippewas of Nawash Unceded First Nation occupy Neyaashiinigmiing Aboriginal Reserve No.27 on the east shore of the Saugeen (BRUCE) Peninsula on Georgian Bay. The nation is Named "Nawash" after a chief Nawash, who fought beside Tecumseh in the war of 1812. The present land base is 63.81 km2. The community is approximately 26 km from Wairton, 64 km from Owen Sound, and 250km from Toronto. 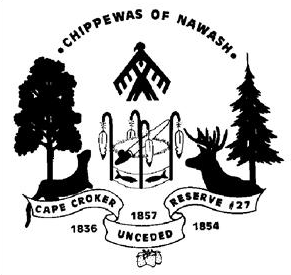 The purpose of this website is to provide the Chippewas of Nawash an Effective means of communicating with Band membership and the general public, on a variety of issues. This site is also a portal to resources regarding the Saugeen Ojibway land claims, fisheries, and other joint resource management issues.